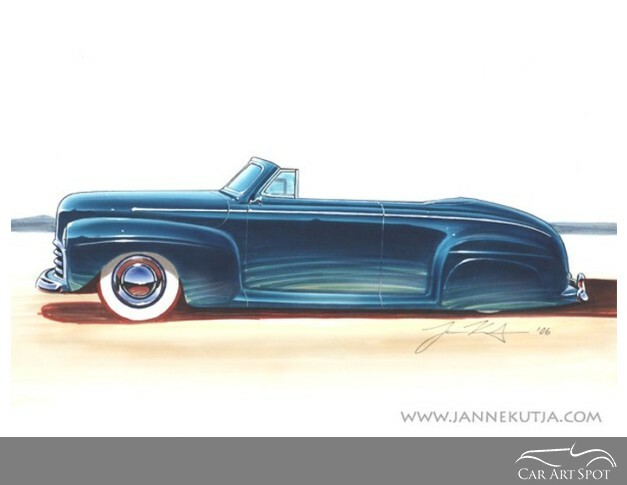 Automotive Artist & Designer Janne Kutja from Finland has been drawn to automotive design and art practically since birth. 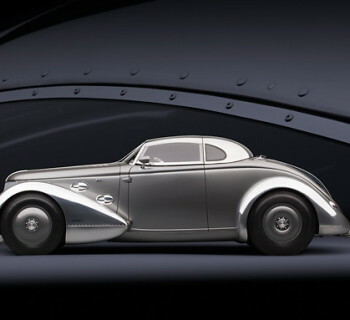 His love of automotive design and art progressed into building his own 'custom cars'. 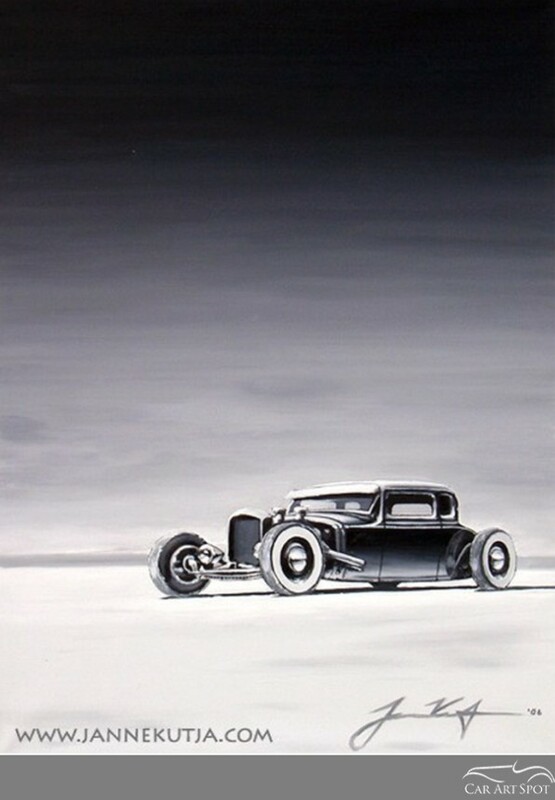 Marcel Haan at CarArtSpot delves deeper into the Finnish born 'House of Cars'. and early 50's but he tries his hand at new styling too. 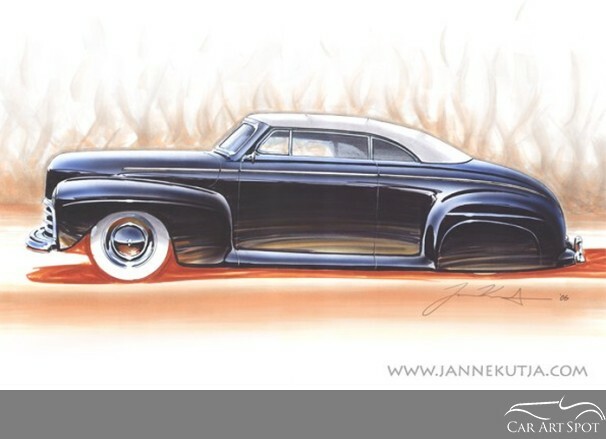 In an interview with Marcel Haan he shares his vision on custom car art. Janne, do you consider yourself to be a designer, an artist, or both? More both really. I basically started with design work but progressed into illustrating and art. I am working marginally for Finland but I also do work for abroad. I understand you are a full time designer & illustrator. Is that in automotives? Yes, I do basically everything for cars and motorcycles. Every so often, I do other work but it's almost always linked to cars. When did you fall in love with cars? Since birth really. My friends' parents saw I could draw and told me to paint some flowers or something. 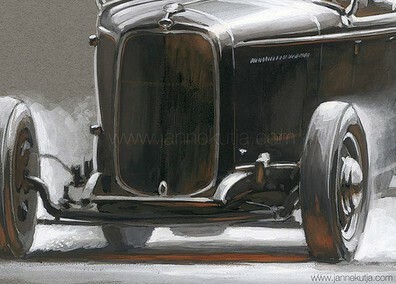 But I went off and painted cars and continued to paint cars. You have a strong preference for American design cars. Is that correct? 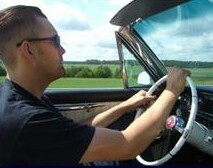 Yes, I am mainly attracted to American cars. What attracts you to those cars? I like the style and there is a strong emotional pull in Finland towards American cars. They get built a lot here too. Does it have to do with the American dream of freedom, or is it purely the design? Maybe the design. When it comes to building custom cars, there are a lot of parts available which also makes it easier for building them. I understand you have been building your own custom cars. Yes, I have a couple of projects on the go but I unfortunately don't get much time for them. 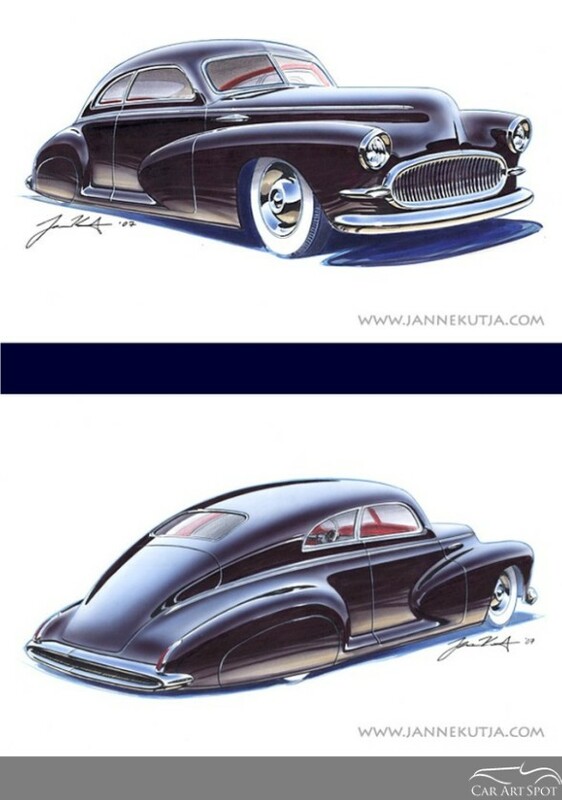 I have a 1947 Ford club coupe which is chopped, channelled and converted into a hardtop. I also have a Volvo PV 544 which I chopped myself. Both cars will be customs when I have finished them. 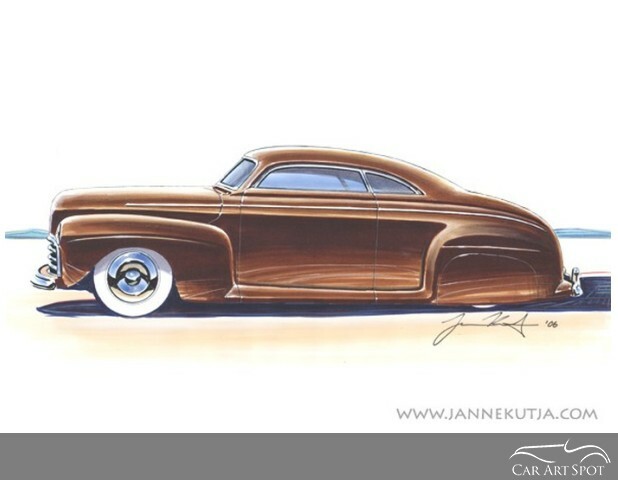 Is the 1947 Ford custom concept on your website? 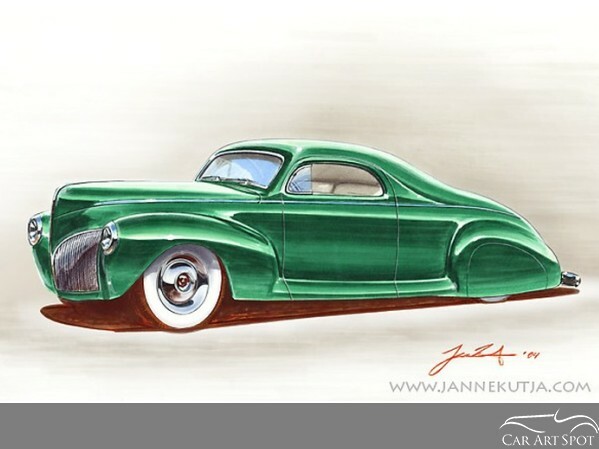 I do have 1947 Ford customs on my website and although there are similarities, it is not exactly like the car I am building. So when customers want their cars customized, how does the process work? Well I first talk about the whole project with the customer and find out what their general needs are. I then continue to produce some sketches and images before doing the final renderings. From the biography on your website, I learned that you started drawing and only later found out about techniques such as airbrushing. When I started in the mid 90's, there was no internet and books and magazines weren't available. I just imagined the easiest way people would do illustrations. Later on I found out about markers and stuff like that. Do you also use the computer for your designs? Yes, I use it all the time but it can't be seen as producing my final results because they are handmade. It's easier to use the computer for some final touches or layers and I can do digital renderings, but I seldom do. So you mainly do handwork? Yes mostly. It depends on the type of customer and what they what. If I do commercial work, I do whatever I feel is necessary but if I do it by hand and computer, it takes a lot longer. 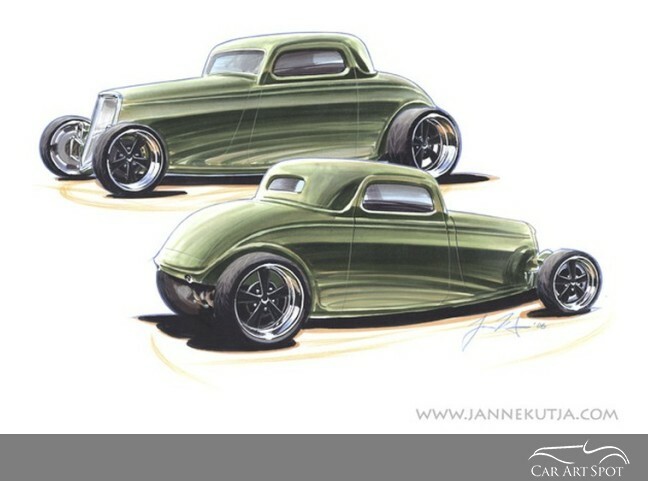 How did you develop your own particular style Janne? I am not even sure if I have my own signature style. I use different styles which you can see on my Flickr site. So that's a hard question for me to answer. 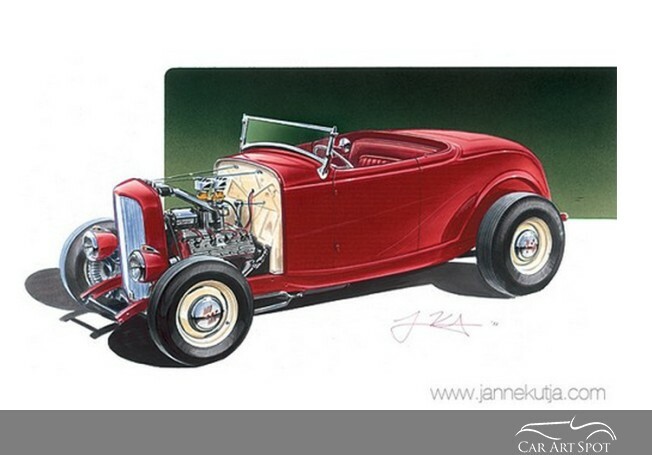 But are you the kind of Chip Foose for Finland? Yes, something like that. I also do oils, acrylics and water colour paintings for customers and also on black board. It just depends on what is needed. 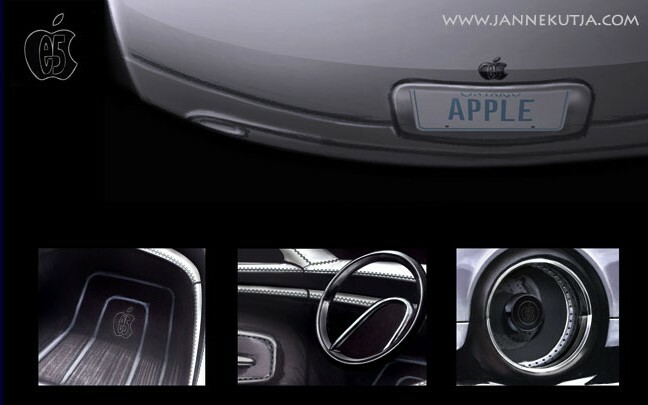 I came across the Apple car concepts on your website. What was that? I did that when I was studying for design. It was one of my school projects. 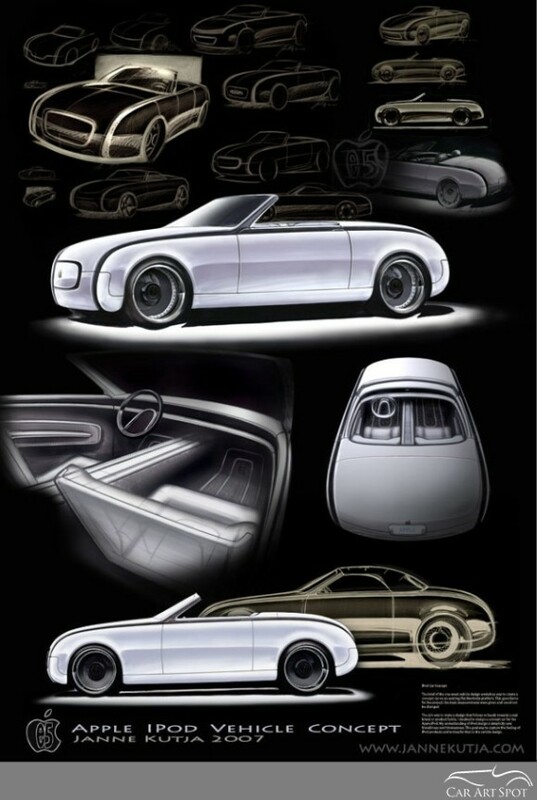 The Lincoln concept was my final degree work for my Bachelor of Art in Industrial Design. Did you ever send this work to Lincoln? Actually I didn't. Maybe I should have done because I didn't make it with any cooperation from a company. It was just myself and one of my designer friends who was already working in the industry. He gave me some opinions now and then and a bit of guidance. It's all my work and I spent about 2000 hours on that project which was a bit too much. 400 hours was basically the amount of time I should have spent on it. I then went on to doing freelance custom design illustrations for a profession and it worked out. 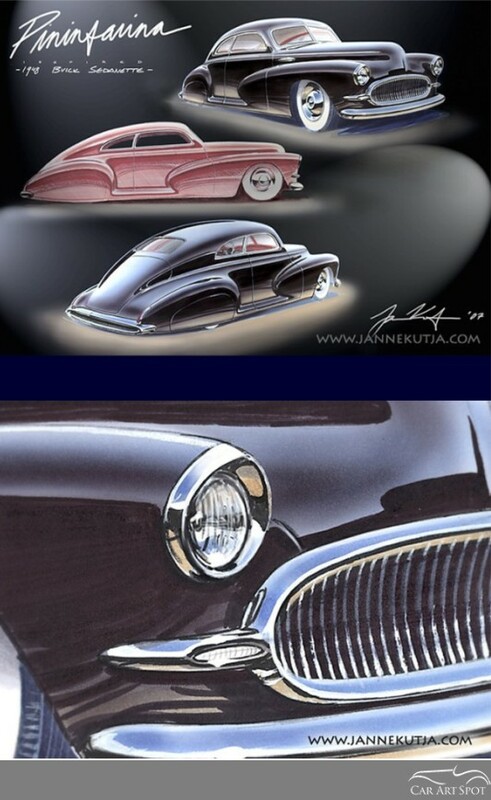 One of your custom concepts is the Buick, an American style car but then you throw in Pininfarina aswell. 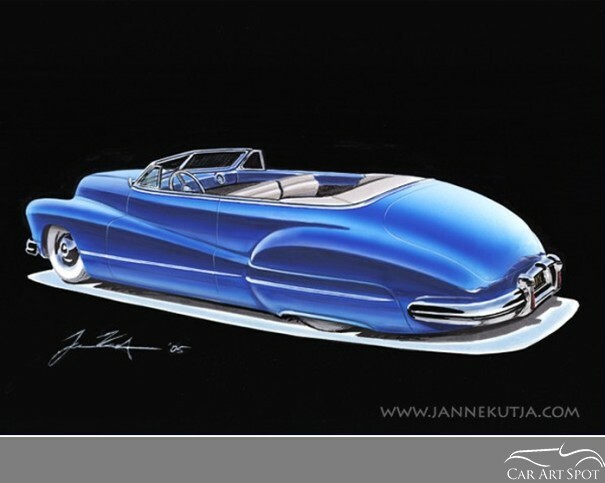 Yes, it was a cooperation with one builder and he wanted to have some Pininfarina parts added and stuff like that. We did several alterations before we ended up with the final concept. So has that final car been built already? It was an unlucky project. The owner of the shop was an old man and I don't know if he became ill but he sold the project and it never got finished. 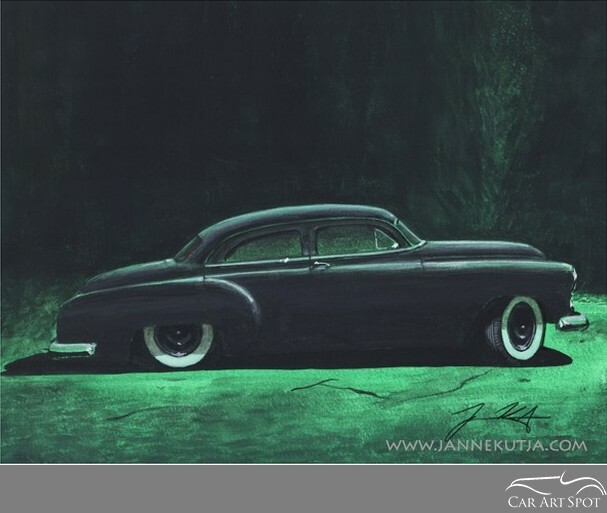 I have done many cars and pictures that have never seen daylight ......ever. They have been sitting here in my studio for the last ten years. It would be nice to see some of the finished cars. Are some of them based on your designs? I have many unfinished but there are some cars that have been finished. 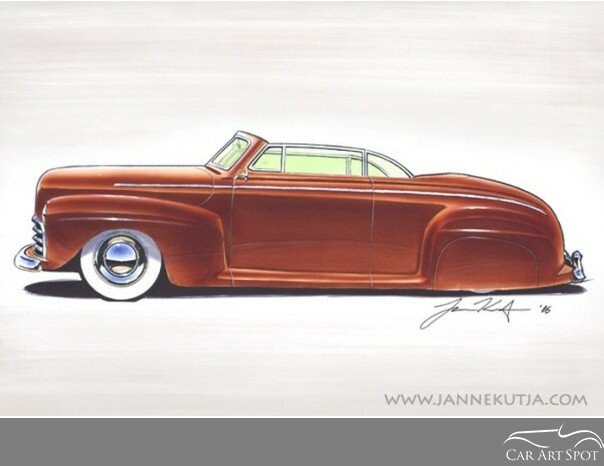 On my website for instance, the 40/41 Lincoln is finished. 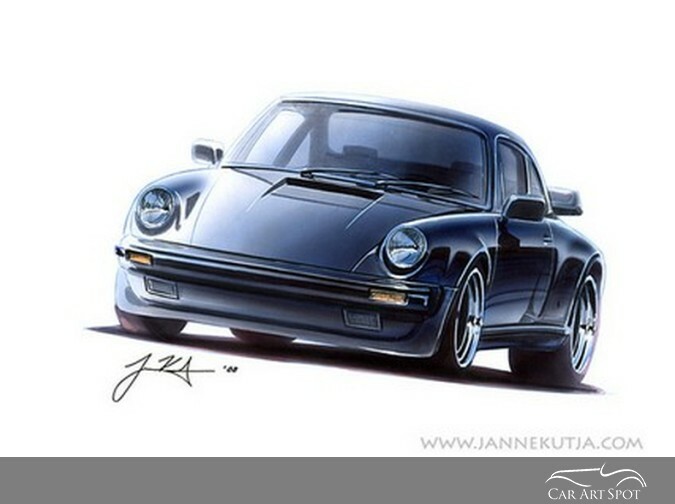 On your website, you have a lot of the concept cars and illustrations; then there is the painting section with black and white oils on canvas. I really like the Hotrod in Salt Lake. Have you done more of these? I should do. I haven't done too many of those. Maybe five or something. 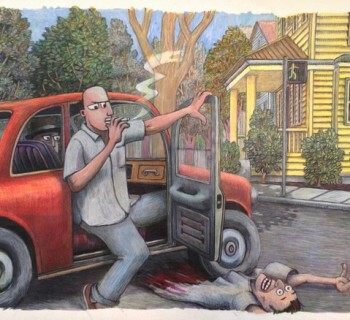 On my Flickr site, you can see more paintings which I have done using various styles. Your work on Flickr definitely shows the progress you are making as an artist Janne. I notice that you are using more backgrounds in your recent work and more emotion. Well I am using black backgrounds as well as full colour backgrounds. So I have used different variations which is mainly for customers to get more idea of all the possibilities. What is your dream as an artist and designer? Do you have a dream project? It's quite tough to make a living with art and it would be nice if things got a bit easier. 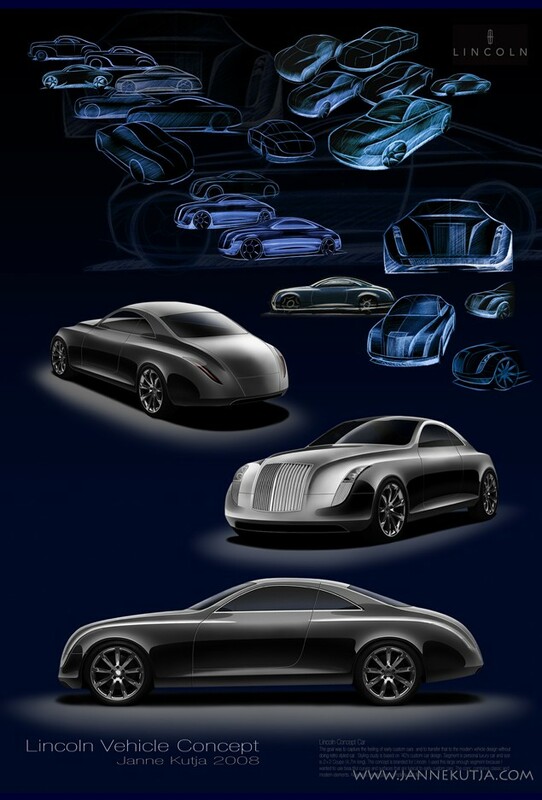 I love working on projects for car designs and elements,really making it a work of art and design. I get a lot of satisfaction out of creating good looking images. Yes, I love designing and painting. Do you have contact with other artists? 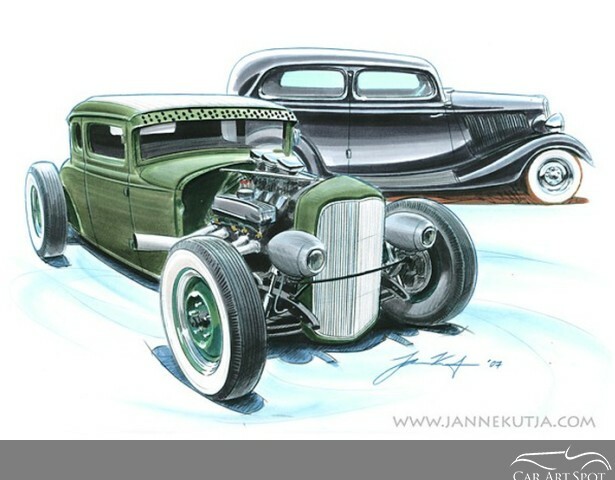 Yes in Finland but there are a lot of pinstripe artists in Finland whose style goes more towards Ed Tillrocks' work. 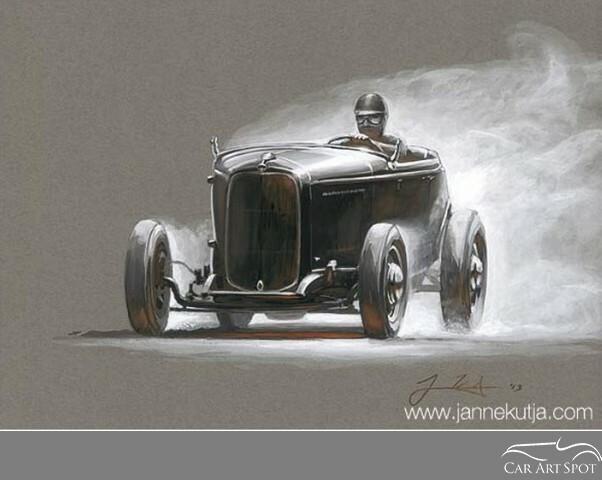 In Finland automotive art is practically non-existent and it's not easy to get to places to see original work or to know who has done what. 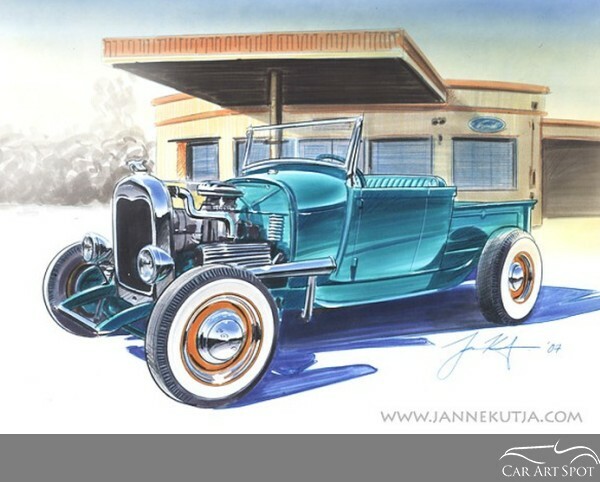 Do you have contact with automotive artists outside of Finland? Yes, but mainly via Facebook and social media. Is your art for sale somewhere? I have all my collections in my home. They are for sale but I don't have a webshop or anything. I usually make a sale via email or social media.